When a reader asked me about reading to active kids I had the answers ready. What a great question, and one I know a lot of parents would like answered. 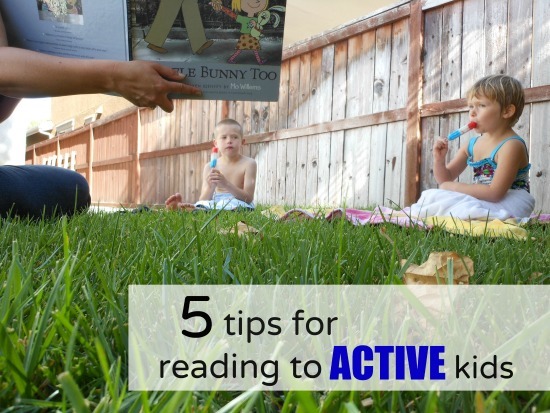 I have a lot of experience with active kids and reading has always been a big part of our day to day. I have a lot of experience reading to active kids. Big M is a mover who has always loved to read. 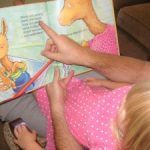 (Read about our first steps into independent reading.) Along the way I’ve picked up a few tricks to engage active kids and inspire a love of reading. Read while they’re engaged in something else. Don’t wait for “story time” to read. Pick up a book while your busy kid is eating or working on a quiet activity. Big M has heard many stories while building with Legos or pushing a train around a track. You can show the pictures when you finish the page. Bring books to life with art activities (like It Looked Like Spilt Milk activity), acting out stories, and storytelling props. Read chapter books. A definite plus to chapter books is the amount of description in the text. Kids who are busy jumping rope while they listen can easily visualize the story with out looking at pictures (read more about young kids and chapter books). Have a large variety of books. Big M is very interested in nonfiction. He is far more likely to pick up a fact book about volcanoes than a story book. Little M loves anything princess (or pink). A wide variety of books increases the chances that your little one will be drawn to one! What tips do you have for reading to active kids? This post originally appeared on June 11, 2012. I LOVE the idea of reading to them during dinnertime!! 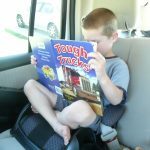 That is one of the few moments I have my 5, 3 and 3 year olds sitting still… that, and in the car… but I doubt that would be a good time to read them a book 😉 Thanks, Crystal. And thanks, Jillian for the awesome tips! Can’t wait to try these out with my active kids! Nice tips. I’ll pass these on to my sister in law. We have kids that same age (2 1/2). My daughter loves to sit and read while her son has to be on the go at all times. Sounds like my sister and I (mine are the ones on the move). It’s fun to watch the differences as they grow up together. I hope these tips help! My active, wiggly daughters loved to be read Rebus books. They could participate and “read” when they were very young. Any book that includes active participation helps. Yes! Any books that require movement are awesome for kids who need to move their bodies. Great tips, Jill! When Aiden isn’t interested in a particular book, we toss it aside and choose another. I let him have as much choice in the books we read as possible. Great suggestions. Allowing the child to work with play doh, reading during bath time, or just giving the child a big bowl of dried beans to run through his or her hands are a few other suggestions. Great suggestions Debbie! I love the reading to the kids while one is in the bath and the other is playing next to me. It’s such a relaxing and fun time. These are great tips! I love the idea of reading while they play, especially during “handsy” activities like Lego or play-doh time. That’s also a great point about descriptive chapter books! Our oldest son has PDD and only wants fact like books and usually can’t manage to sit still unless he is eating or doing something else. I’ve honestly never thought to read him a chapter book aloud. Silly me!! Can’t wait to try! Isn’t motherhood all about “light bulb” moments?!?! I hope it works well for you, reading to the kids is one of my favorite things to do. Great article, thanks for sharing these tips!